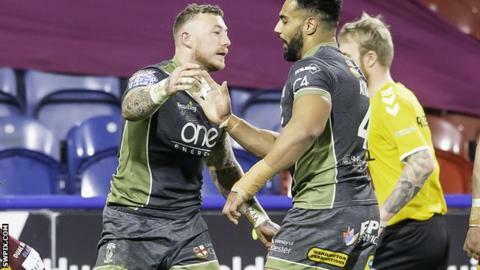 Josh Charnley and Ryan Atkins scored two tries each as leaders Warrington maintained their perfect start to the Super League season by winning easily at bottom club Huddersfield. The result was rarely in doubt once Atkins' opening effort and Charnley's double gave the Wire a healthy lead. The home side did give themselves hope with tries either side of the break. But that was short-lived, as the visitors pulled clear again to complete a third win from as many games. The Giants have now lost all three of their matches and this was a contest they rarely looked competitive in. Akuila Uate fumbled a kick early on to allow Atkins to break the deadlock, and by the time Charnley had twice gone over in the corner it was in danger of becoming a rout. To Huddersfield's credit, Jermaine McGillvary's try on his return from injury and a Matty English score just after the break did pull them back into the match. But Adam Walne was sin-binned for a high tackle soon after, allowing Warrington to regain control and comfortably close out victory. Huddersfield: McIntosh; McGillvary, Turner, Wardle, Uate; Gaskell, Frawley; Ikahihifo, O'Brien, Matagi, Murphy, Mellor, Lawrence. Replacements: Leeming, Ta'ai, English, Walne. Warrington: Ratchford; Lineham, Goodwin, Atkins, Charnley; Austin, Patton; Hill, D Clark, Cooper, King, Hughes, Tasi. Replacements: Murdoch-Masila, J Clark, Philbin, Mamo.